Lenovo's latest tablet continues its flexible approach with the Lenovo Yoga Tablet 10 HD+ bringing a Full HD screen to the repositionable slate. 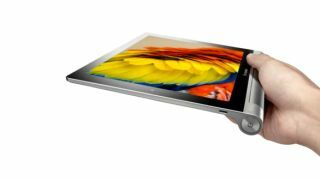 Landing today at MWC 2014, the tablet comes with a 10.1-inch display that rocks Full HD 1920 x 1200 resolution, and the cylindrical battery means you'll be able to use it in the same 'hold', 'tilt' and 'stand' modes as its predecessor, the Lenovo Yoga Tablet 10. Under the hood we're looking at a quad-core Snapdragon 400 processor backed up by 2GB of memory and 32GB of storage. Disappointingly, the tablet only runs Android 4.3 rather than the more up-to-date KitKat. Lenovo promises that there'll be an over-the-air update to 4.4 but doesn't say when to expect that. As for multimedia and connectivity tools, the device rocks an HD 8MP rear-mounted snapper, a 1.6MP front-facing camera, Bluetooth 4.0 a micro USB port and Dolby audio know-how. Lenovo's promising 18 hours of battery life from the tablet, although we'll reserve judgement on that until we get a chance to put it properly through its paces. In the meantime, we'll be grabbing a Lenovo Yoga Tablet 10 HD+ at MWC so stay tuned for our hands on review. The Yoga Tablet 10 HD+ will be available in some markets in April with models starting at $349 (around AU$390). The UK will get its mitts on the tablet in May, priced at £299 for the Wi-Fi model and £329 for the 3G version.